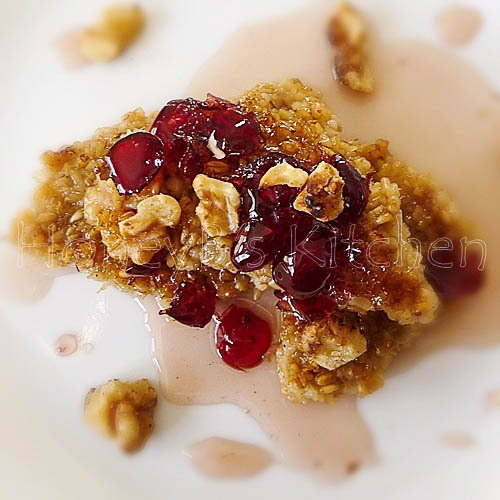 Cooked Steel Cut Oats that have been shaped and sauteed then topped with a flavorful syrup! 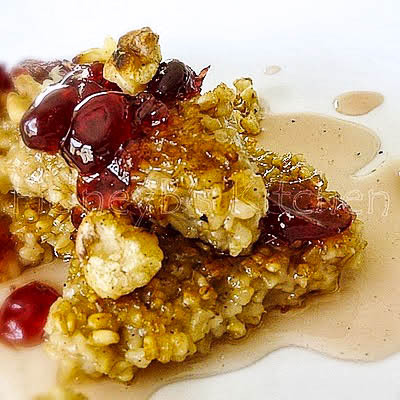 These Sauteed Steel Cut Oat Cakes with Cranberry Infused Maple Syrup make a delicious addition to your weekend brunch! It’s been awhile since I’ve posted two days in a row, but today I just can’t help it! This recipe is just that good. Not to mention it’s a good make ahead recipe that you can feed your kids on a cold winter morning before they head out to the bus stop! This would even be a delicious dinner treat along with some crispy bacon! I’ve had some steel cut oats in my cupboard for a while now and have been thinking that it was about time I used them. I just bought the “Way to Cook Vegetarian” cookbook from Cooking Light and they had a recipe in there using steel cut oats that you cooked, cooled, cut and then sautéed in a frying pan. They serve theirs with a cider syrup and fruit compote. While it all looked good (um, that is why I wanted to make it), I wouldn’t be me if I wasn’t thinking up some other way to serve these up. I love how this turned out and will definitely be making this one over and over! P.S. These are definitely Grumpy approved! Bring the water, milk, salt, and brown sugar to a boil. Add steel oats and bring back to a boil, then turn burner down to a simmer. Simmer about 20 minutes or until oats have thickened and liquid is absorbed. Spray a 9×13 pan with cooking spray. Pour oat mixture into pan. Set aside to cool. When cool, place in refrigerator to chill at least one hour (longer is better). When you are ready to sauté the oat cakes, removed pan from refrigerator and turn pan upside down. You may need to jiggle one side loose, but once you do that, the rest will fall out of the pan fairly easily. Cut oats into squares or triangles. I used a little butter to sauté my cakes but you can also use cooking spray. Heat frying pan over medium heat and once butter sizzles, or pan is hot, add oat cakes you have cut into pan. Let sauté about 3-4 minutes or until browned, then turn to sauté other side. While your cakes are sizzling, add your syrup and cranberries to a small sauce pan and turn heat onto high. Once syrup starts to bubble, turn heat down to bring just to a simmer. Simmer 2-3 minutes – don’t go much longer as this will thicken quick fast. Place cakes on serving plate and top with cranberry infused syrup. Top with toasted walnuts if desired. Looks great and I sure need this for my Cholestral is so high this will help lower it deliciously! May I come over for breakfast? No one else at my house would eat that, but I would LOVE it. Well, hmm, though, my 4 year old does like oatmeal. I should try it (just so I can have some) and see if he'd eat it. Looks great! Yum, this looks amazing!! I've never thought to sautee steel cut oats. Wonderful. These look so, so, so good–I have never done oat cakes. I will definitely give this a try. Brilliant! Wow, would you look at that! I'll bet that tastes a sweet and sticky as the picture looks. Yum! Now that sounds like a nice breakfast treat for the kids, crunchy whole grain goodness with sweetness on top. These are delicious. I just need to get my sautee skills perfected. These sounds so good. What a great treat with little guilt. This is quite a bit shorter of a cooking time for steel cut oats than I'm used to. I usually cook mine for about 45 minutes. Is this on purpose for the texture of the cakes or have I just been cooking my oatmeal too long this entire time? I'm going to make this tomorrow for a brunch party I am having. It's a great way to serve oatmeal to a crowd and make it easy and fancy! G'day! have some steel oats YELLING at me to come out of the pantry Shelby! YUM! These were so good! I sauteed in coconut oil until they were crispy around the edges. My little ones loved them – so did my husband and I! I didn't make the syrup as stated – I just served ours with dried cherries on top and drizzled with maple syrup. So tasty!